Who would have predicted that Saturday Night Live would end the year with another sneering attack on President Trump? 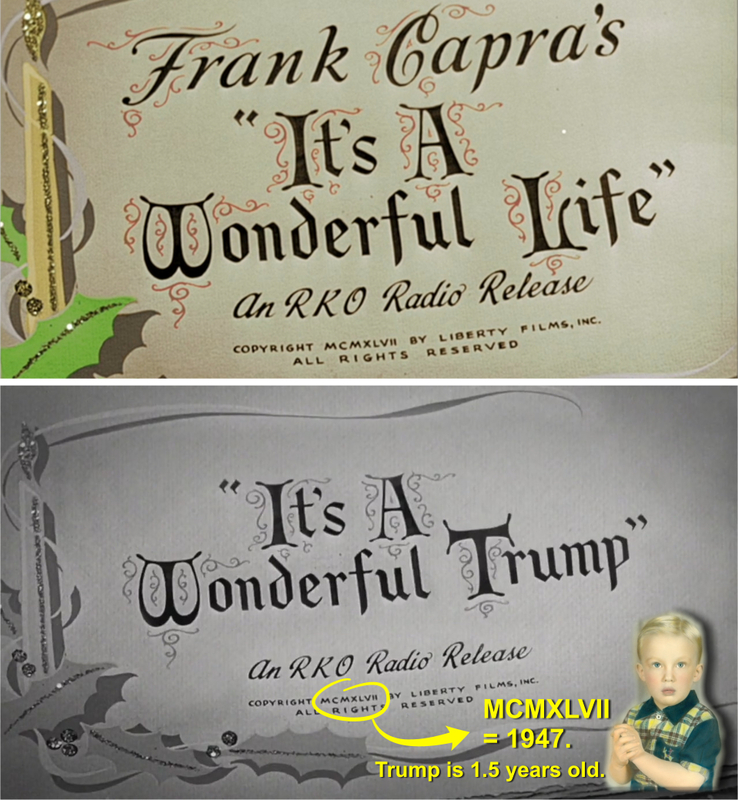 This time they sprayed Leftist graffiti and TDS all over Frank Capra’s classic Christmas movie ‘It’s a Wonderful Life.’ Jimmy Stewart, who starred in the 1946 Christmas fantasy, would probably turn in his grave if he saw the adaptation. To say the 8.5-minute satire used the wrong story is an understatement. 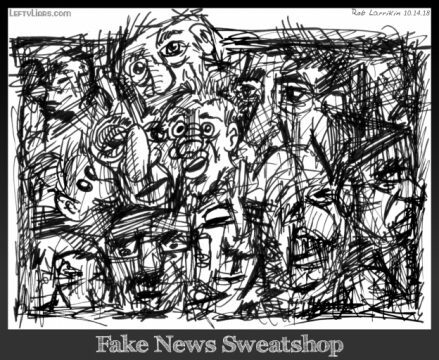 It would be difficult to find a tale more out of kilter with Trump’s life and to make matters worse, the SNL satire was full of mistakes only lazy amateurs could make. Some might say, “Relax, it was just a funny sketch,” but they would be ignoring all the work and trouble SNL went to. Remember, they hired four Hollywood blockbuster multi-millionaire actors; Ben Stiller, Matthew Damon, Alexander Baldwin, and Robert De Niro, who would typically charge hundreds of thousands if not millions for an 8.5-minute film. Then there was the makeup and special effects. De Niro’s lower jaw angles were padded out to look like Mueller’s Frankenstein mandible. How much did that cost? There are the wigs, clothes, music, graphics and special effects, which add up. Yet they made blundering mistakes with the plot relevance, graphics, politics, and humor, which divorced SNL years ago. The rusty old robot audience was no better than canned laughter. De Niro announced earlier this year that he would never play Trump in a movie, so it is obvious he only plays people he respects and admires. For instance, he was happy to play the role of the fictional mafia boss Vito Corleone in The Godfather Part II. 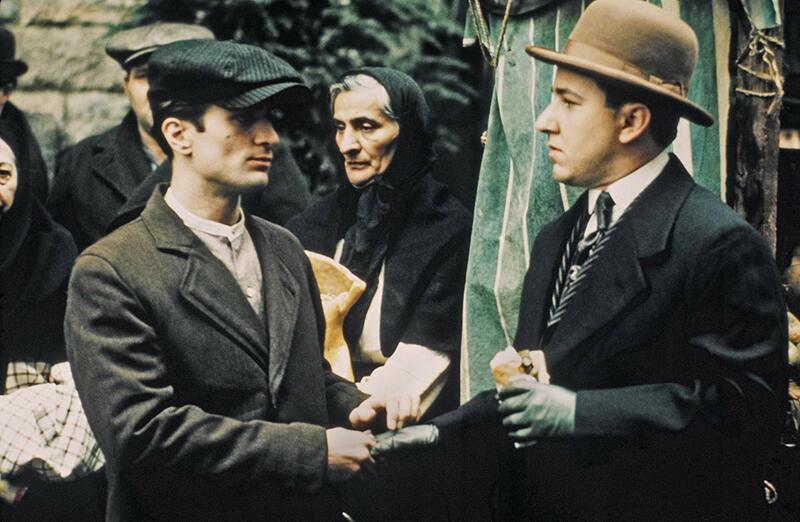 Corleone was a murderer, blackmailer, kidnapper, extortionist, racketeer, thief, torturer, money launderer, pimp, and drug runner. De Niro portrayed him as a kind, humane and generous man, helping his community. That should tell you all you need to know about De Niro’s ethics. Liberty Bell and fake Liberty Bell. Click for high-res. 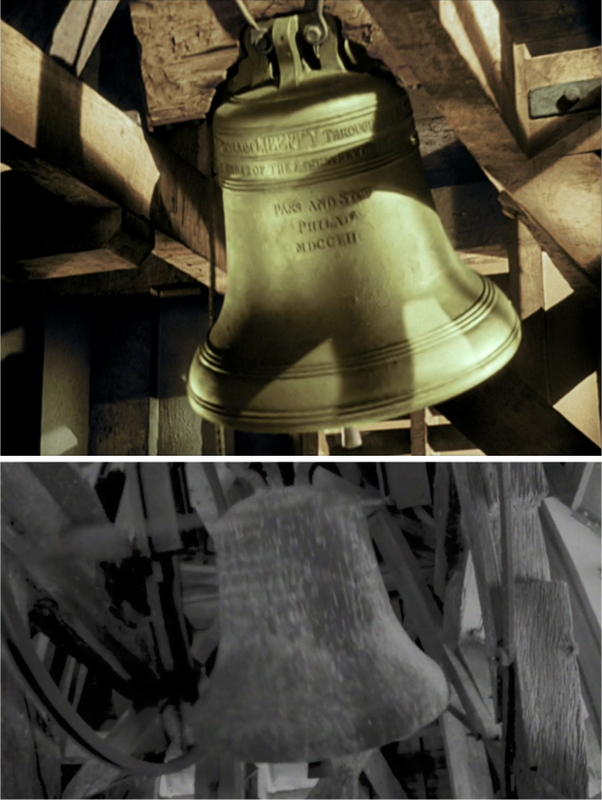 At the start of Capra’s It’s a Wonderful Life, we see the Liberty Bell swinging [photo-top]. Its biblical inscription reads, “Proclaim LIBERTY Throughout all the Land unto all the Inhabitants Thereof.” That must have been too much for the socialists in SNL, who replaced the Liberty Bell with some other bell from a different place [bottom]. 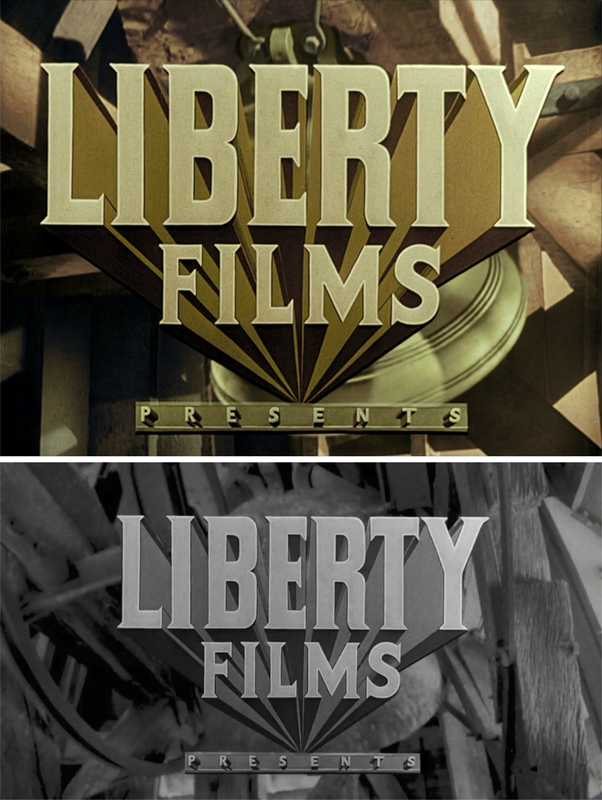 Some might think it was for copyright reasons, but if so, why did they cut out the “Liberty Films Presents” graphic from the original movie, and stick it over the top? 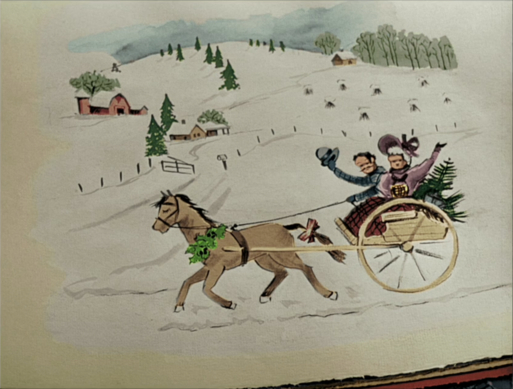 Having removed the Liberty Bell and any mention of liberty or Christianity, they chopped the next graphic, a picture of a couple riding a horse and buggy with a Christmas Horse Head Wreath, carrying a Christmas tree. 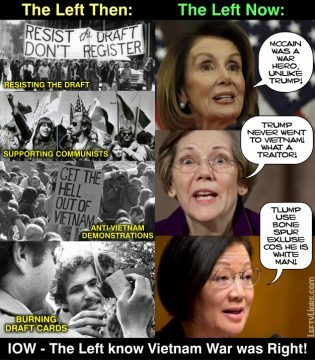 That image must have sent shivers up their spines – it was just not appropriate for the new United Socialist States of America! A female voice prays, “And Lord, please help Donald Trump, he’s not a good man, but he is in trouble.” This refers to their latest myth that Trump is in trouble with Mueller. They are easily fooled by the pugnacious stomping and saber rattling of a showoff. 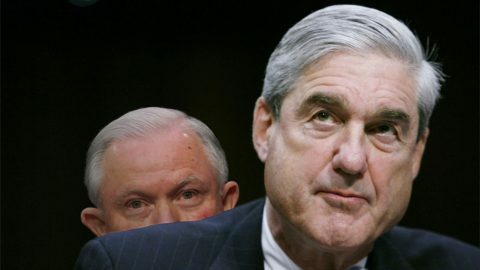 Like the Wizard of Oz Mueller is a loudmouth with smoke and mirrors. Someone imitates Melania Trump, praying for a Cartier watch. The mistake there is that Melania is rich. If she were poor, it might make sense. Perhaps the joke writers were snorting too much cocaine when they came up with that. They go to the trouble of hiring four of Hollywood’s most excellent actors and having all the costumes and makeup, and De Niro’s false mandible put on by expert makeup prosthetic artists, but they can’t be bothered changing the date from 1947 to 2018 (which is MMXVIII). Here guys, let me open up Photoshop and do it for you. 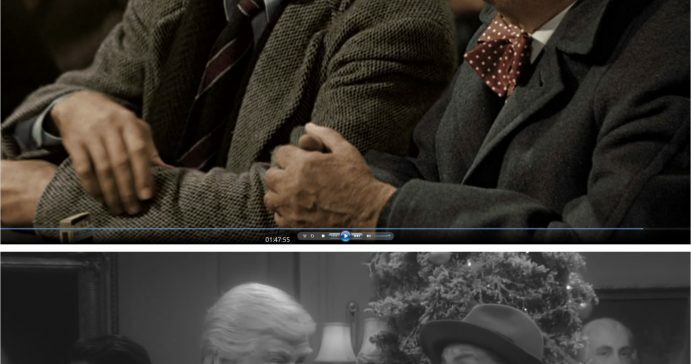 They then skip most of the movie, and we arrive at the scene where the main character, played by Jimmy Stewart, meets his guardian angel, played by an English actor, Henry Travers. He is an old, white Anglo Saxon male. Could SNL possibly allow an old white male to play the role of the guardian angel, as it was in the original story, as the author intended? No, that would be racist. So like the Liberty Bell and Christmas horse and buggy, the old white man is removed. He is replaced by a young African American. I suppose we should be thankful he is wearing a bowtie and not a G-string. 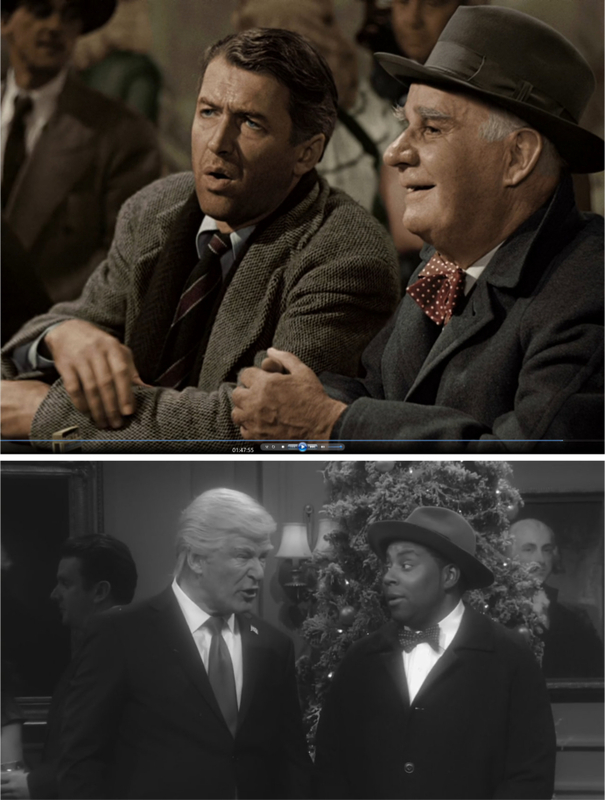 Amazingly they replace Jimmy Stewart, who played the role of a soft-hearted liberal do-gooder, with Donald Trump, a wealthy businessman who sacked soft do-gooders all his life. It appears the comedy writers had finished all the cocaine and were now on to some potent ganja weed. 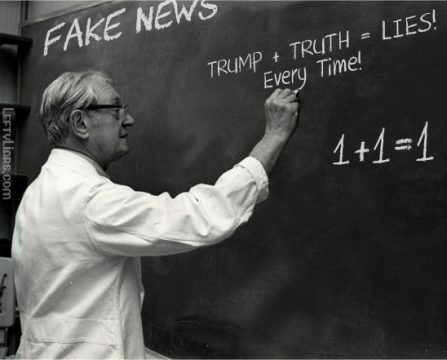 They had forgotten by this time who Trump even was. Trump’s world is falling apart. Trump wishes he’d never been President. Trump’s staff would be so much happier and more prosperous if they didn’t work for Trump. Kellyanne Conway has sold her soul to the devil. Clinton’s emails were nothing significant. Trump’s son Eric is an uneducated dimwit. Trump holds Melania’s language skills back. Anyone can run a real estate company. Trump would marry a bimbo if single again. Michael Cohen was not just another employee, but Trump’s closest friend. Trump will open a Trump Tower in Moscow. Trump would also be better off if he were not President. Trump is against Muslims immigrating into the U.S.
Transgender Navy Seals are heroes and not a drain on taxpayers after all. Supreme Court Justice Kavanaugh is an extreme partygoer, obsessed with beer. Kavanaugh hasn’t the temperament for being a judge. Kavanaugh threatens violence and drinks too much beer. Building walls and mining coal are impractical and insane activities. Trump is afraid of Robert Mueller. Trump is a treasonous idiot. All those cliches in such a short video. Lastly, they implied that Mueller would rather be doing other things; that he considers chasing Trump a big sacrifice. In fact it is clear that Mueller relishes the chance to hurt Trump and loves hounding the man. We have all met those particular cops who love their power too much. They seem to get joy out of causing misery. That is how Mueller comes across – like an angry dog with his favorite bone. He is the kind of cop cops hate.